Jin-Roh (人狼, Jinrō, lit. "Man-Wolf"), also known as Jin-Roh: The Wolf Brigade in its American release, is a 1999 Japanese animated thriller directed by Hiroyuki Okiura. The film is the third adaptation of Mamoru Oshii's Kerberos saga manga, Kerberos Panzer Cop, after the two live-action films: The Red Spectacles and StrayDog: Kerberos Panzer Cops released in 1987 and 1991 in Japanese theaters. The film follows Kazuki Fuse, a member of a special police unit set during an alternate history of 1950s Japanese riots. Failing to follow an order to execute a frightened young girl only to see her commit suicide by detonating an improvised explosive device before his very eyes, Fuse is put on trial and sent back to the training camp for re-evaluation. Visiting the grave of the suicide, he meets Kei, the girl's sister, who does not hold him responsible for her demise. The film proceeds as the two develop a peculiar relationship. Mamoru Oshii, the creator of the Kerberos saga, had desired to make Jin-Roh years earlier as a live-action film. However, Oshii decided that the film would be animated, and hired Okiura to direct the film and Production I.G to produce the film. The film premiered on November 17, 1999, in France, and Bandai Entertainment licensed the film for an English-language release in North America and Europe. It has been relicensed for Blu-ray/DVD in North America by Discotek Media. The story is set in alternate-history Japan in the 1950s following atomic bombing and occupation of the country by Germany and the post-war recovery. It focuses on Kazuki Fuse, a member of the elite Kerberos Panzer Cops, a metropolitan anti terror unit. Fuse confronts his own humanity when he fails to shoot a young female terrorist who they trap in the storm-water tunnels. She detonates a bomb in front of him, but only kills herself. The incident damages the reputation of the unit and Fuse is reprimanded. He visits the ashes of the dead girl and meets Kei Amemiya, who claims to be the elder sister of the terrorist and they develop a friendship. Kei is eventually revealed not to be the suicide bomber's sister, but a former bomb courier coerced into acting on behalf of the Special Unit's rival division Public Security. A trap is set by the Capitol Police and the Public Security Division intended to discredit the Special Unit with Kei as bait to catch Fuse, intending to show a terrorist passing a satchel bomb to a member of the Panzers. However, Fuse sneaks in, seizes Kei, neutralizes the Capitol Police agents and they escape. Later, Kei reveals her role in the deception and suggests they leave together, but Fuse decides to stay. They make their way to the underground tunnels once more, where they are met by members of the Wolf Brigade, a secret, deep-cover unit in the Kerberos Corps led by Hajime Handa. They provide Fuse with a full set of armor and weaponry, before leaving with Kei in tow. Handa explains to Kei that the Wolf Brigade has used Public Security Division's plan to flush out those who were most active in trying to eliminate the Kerberos Corps, and eliminate them in turn. Public Security agents follow a tracking device in Kei’s bag and make their way into the tunnels. They encounter the fully armored Fuse, who slaughters them all. Later, the Wolf Brigade meet in junkyard and Fuse is ordered to kill Kei to ensure she is never recaptured by Public Security. Kei embraces Fuse and sadly recites the dialogue of Little Red Riding Hood, describing the grotesque appearance of the wolf disguised as a loved one. Fuse is distraught, but kills Kei anyway, sacrificing his humanity to remain part of the pack. The old sergeant solemnly compares Kei's fate to the demise of Red Riding Hood and the triumph of the wolf. Mamoru Oshii had wanted to do Jin-Roh several years prior, and was about to propose the project to Bandai Visual at a meeting. However, they offered him to a job he could not turn down, so the project was put on back burner. The film he ended up making instead was Ghost in the Shell. In the end though, the condition set by Bandai Visual to produce the film was for Mamoru Oshii not to direct it, after the two live versions of the series, The Red Spectacles and StrayDog: Kerberos Panzer Cops, did not perform to expectations. So he offered the job to Hiroyuki Okiura, the animation supervisor who criticized Oshii's handling of accuracy in stage setting during the famed museum sequence featured in Ghost in the Shell. The only thing Mamoru Oshii did after writing the script was to write up additional agitation speech for the opening protest scene, just before the dubbing. He happened to be in the same building for re-mastering of Patlabor 2: The Movie. 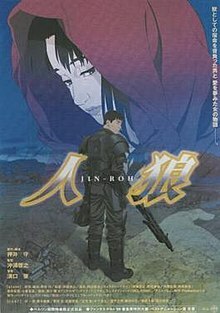 Jin-Roh was originally planned to be the third and final live-action feature film of the Kerberos trilogy, but its production wasn't possible until 1994, while Oshii was already working on Ghost in the Shell. As the filmmaker wasn't able to produce two films in the same time but didn't want someone else to direct his final episode, Oshii decided that the third episode would be an anime instead. He committed Jin-Roh as a debut film to a trusted young collaborator, Hiroyuki Okiura for he worked on animation movies such as Ghost in the Shell (character designer) and Patlabor 2: The Movie. The film's musical score was composed by Hajime Mizoguchi. The film's theme focuses on what happened to Japan years after the Third Reich ended occupation of the country in the early 1960s. Hyper commends the film for its "art direction and character design which are beautiful examples of hand-drawn animation and the music fits the action (or lack thereof) brilliantly. However, the film's "slow, deliberate pace" is criticised. Helen McCarthy in 500 Essential Anime Movies called the anime "a must-see" and praised the score and the design, commenting on "some breathtakingly composed scenes". A South Korean live-action remake titled Illang: The Wolf Brigade directed by Kim Jee-woon updates the setting from Japan to a dystopian South Korea, where the plot revolves around plans to unite the two Koreas. The film stars Gang Dong-won, Han Hyo-joo, and Jung Woo-sung, and was released on July 15, 2018. ^ Discotek Media - Tijdlijnfoto's. Facebook. Retrieved on 2014-05-12. ^ "Warner Bros. and KIM Jee-woon Team Up Once More on JIN-ROH Remake". www.koreanfilm.or.kr. ^ "KIM Jee-woon's Sci-fi Action INRANG Starts Shooting in August". Koreanfilm.or.kr. 2017-07-28. Retrieved 2018-05-06. ^ Dan42's JIN-ROH lair (Interviews). Dan42.com. Retrieved on 2014-05-12. ^ "Jin-Roh: The Wolf Brigade". Hyper. Next Media (166): 84. August 2007. ISSN 1320-7458. ^ "Cast Set For Korean "Jin-Roh" Remake". ^ "Jin-roh : "The Wolf Brigade" Set for Unexpected Korean Remake". 17 September 2017. ^ "Korean Live-Action Jin-Roh Film Aims to Cast Actress Han Hyo-joo". ^ "KIM Jee-woon's Sci-fi Action Drama INRANG Completes 8 Months of Filming". Koreanfilm.or.kr. Retrieved 2018-05-06. ^ "YUBARI INTERNATIONAL FANTASTIC FILM FESTIVAL 2000". yubarifanta.com. Archived from the original on 2011-07-18. Retrieved 2009-09-20. Gordon, Andrew (2003). A Modern History of Japan: From Tokugawa Times to the Present. Oxford University Press. ISBN 0-19-511060-9. Gustav Horn, Carl (2002). "Frontiers of Total Filmmaking: Mamoru Oshii Creator of Jin-Roh." Pamphlet from DVD. Jin-Roh: the Wolf Brigade Special Edition. Ruh, Brian (2004). Stray Dog of Anime: The Films of Mamoru Oshii. Palgrave Macmillan. ISBN 1-4039-6334-7.